All meetings are held at the Moose Lodge, NW Corner of SR 107, Montpelier OH at 12 Noon. 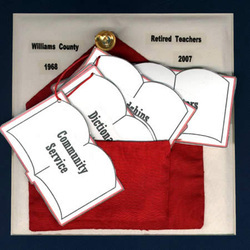 The organization of a Williams County Chapter of Retired Teachers of the ORTA was formulated and officers were elected at an informational luncheon held on Tuesday, September 17, 1968 at Everhart’s Restaurant in Bryan, Ohio. The officers elected for the WCRTA were: Orville Thomas of Northwest Township- President, and Mrs. Lela Thomas of rural Bryan- Secretary/Treasurer. Local dues were voted to be $1.00 per year. At the first general meeting of the Williams Co. RTA, held on October 1, 1968 a chapter constitution was adopted. Twenty-six chapter members were listed on the roll. The chapter has flourished with ambitious leaders and committee chairpersons through the years. Dues are now $5.00 and we have 225 members on the roll. We have established a scholarship given to students going into the field of education. The scholarship fund has grown so that we can give three $1000 scholarships each year. We purchased a brick with our chapter name on it when the STRS building was remodeled. It can be seen on the STRS patio at Broad St. and Fifth St. in Columbus. Currently, we are gathering funds to annually buy dictionaries for all Third Graders in the county. 2007 is our second year of this on-going project. Our chapter meets four times a year: April, June, September, and November, at the Ramada Inn at Montpelier. All meetings are at noon with a lovely luncheon. The exception is that our June meeting is held at 6:00 p.m. and is a dinner meeting. We usually have about 80 retired educators attending our meetings.